The red and white Border Collie’s long eyelashes shaded his eyes from the sunny scene in front of him. Stretched out under his favorite tree, River, as his Lady called him, kept an eye on the young Border Collie, Levi, running joyfully around the yard. Levi ran for the sheer enjoyment of running, feeling the wind against his muzzle. Played out, Levi stopped and collapsed next to River. “Harumpf.” River snorted, as he appraised his over-heated companion. Levi stretched and rolled on his back. He was tired of River’s lectures and lessons on life. River jumped up and stood over Levi. “You will listen!” He curled his lip, his full red and white tail held stiffly behind him. Levi lowered his head and looked away from River’s piercing stare. Levi yawned and struggled to stay awake. “A Border Collie is a hard worker. There is no time to play when there is work to be done. Only a Border Collie can herd with decisiveness, precision, going inside the sheep’s mind. Are you listening, Young One? Levi’s eyes closed. His thick black and white coat shone through the branches. River stood up and walked to the gate. The Lady would come outside shortly with treats and cooing words. The next day River himself loped through the green grass, stalking tree rats, munching on acorns, while Levi ran circles around The Lady, loving the attention she gave him. River stopped and focused on the surroundings, keeping track of unusual sounds. The Lady finally walked inside, leaving the two dogs in the yard. “My breathing is getting harder, Young One. There is more to the Code of Border Collie.” Levi saw a branch fall to the ground and started to run and grab it. River barked and nipped at Levi to keep him nearby. “You must serve, you must protect, you must work hard. There is more.” Levi turned his head from side to side, wondering what more there could be. He settled his face between his paws and listened intently to River. Many days later The Lady brought home a little black and white Border Collie. Levi danced and circled around the bundle of energy that The Lady held in her arms. Gently she set the pup on the ground. In a flash the pup ran to River, who growled and nipped the baby. “Have you no respect for your elders? You are a Border Collie!” The puppy mewed piteously but Levi sniffed it and was happy-a kindred spirit. Over time Levi and the puppy, Catcher, became friends, running in the field, grabbing sticks, chasing each other. River watched from under the trees, disgusted. There is so much to teach them.” He barked at Levi to join him under the tree, the fall air held a crispness, there were more leaves on the ground. Levi walked over and put his head on River’s side, quietly, centering. The pup ran around chasing a butterfly. The following spring Levi went over to the tree and sniffed the now abandoned spot of his mentor. He remembered the lessons River had told him. Turning to the other bush where the younger dog, Catcher, played, Levi barked to him. “Come here! I have much to teach you. It is time for you to learn the Code of Border Collie. 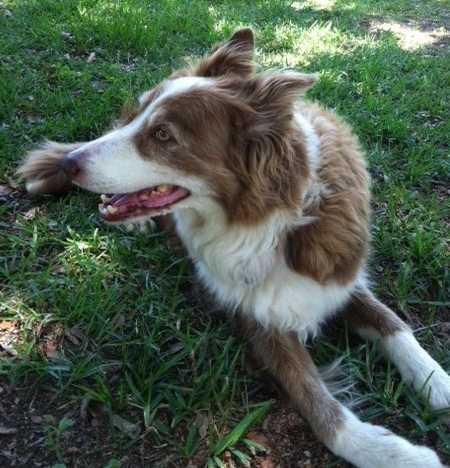 This entry was posted in border collies and tagged Border Collie, Border Collies. Bookmark the permalink. Really enjoyed this one! I, too, have an older BC and I hope Catcher imparts his wisdom to Gus before he passes. If Gus would listen! 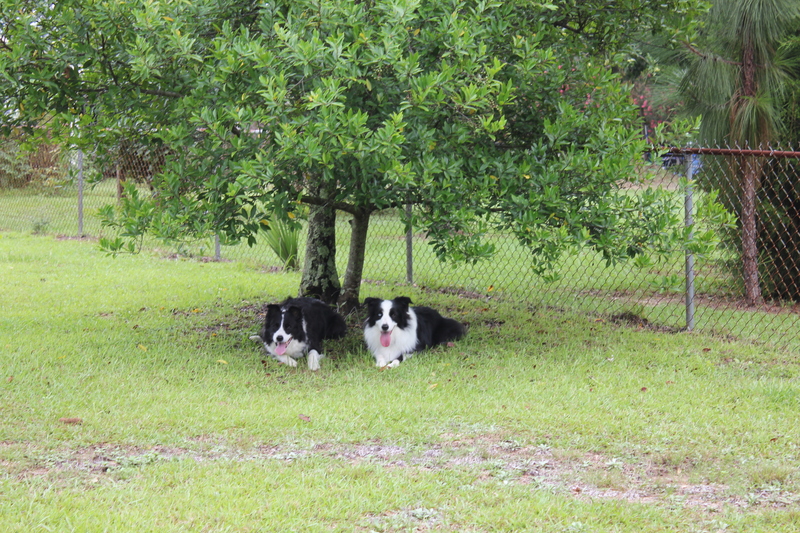 I have seen each generation of my Border Collies sitting under the tree and wondered what they were “talking” about. So I thought of this story. My Catcher would also pass mischievous wisdoms.